The online reaction to the reports on racial segregation in New York state’s public schools reminded me, yet again, that most people think of New York as an integrated city, and are surprised or incredulous when that impression is contradicted. Were we to do this in Chicago, half the South and West Sides would be lit up. 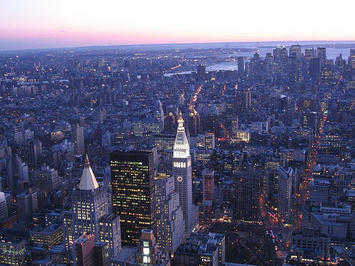 But in New York, black neighborhoods have become significantly mixed, in particular with people of Hispanic descent. This is a phenomenon Chicagoans are used to in formerly all-white communities – places like Jefferson Park or Bridgeport, which as recently as 1980 were overwhelmingly white, now have very large Latino and Asian populations – but in New York, it’s happened in both white and black neighborhoods. That said, white folks in New York have still on the whole declined to move to black areas, except for some nibbling along the edges in Harlem and central Brooklyn. That means that instead of measuring segregation the way we might in Chicago – by looking for very high concentrations of a single ethnic group – it makes more sense to look for the absence of either white or black people. But it also suggests a racial landscape that looks different from that of Chicago, and lots of other American cities, in important ways. 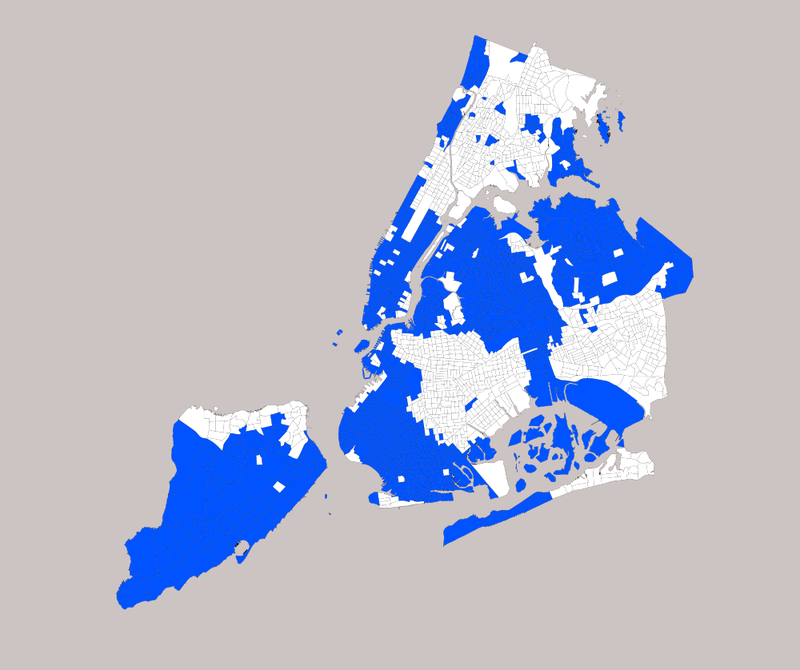 In particular, where Chicago has a relatively simple racial geography – white neighborhoods at various levels of integration with Hispanics and Asians to the north and northwest, black and Hispanic neighborhoods to the south and west, with only a few small islands like Hyde Park and Bridgeport that break the pattern – New York’s segregated neighborhoods form a more complex patchwork across the city. That means that while a North Sider in Chicago might go years without having to even pass through a black neighborhood, lots of white New Yorkers have to get through the non-white parts of Brooklyn or the Bronx to reach job and entertainment districts in Manhattan or northern Brooklyn. Note: This piece focuses on white-black segregation because that, for various social and historical reasons, has been by far the most significant geographic separation in American cities, certainly in the Midwest and Northeast. 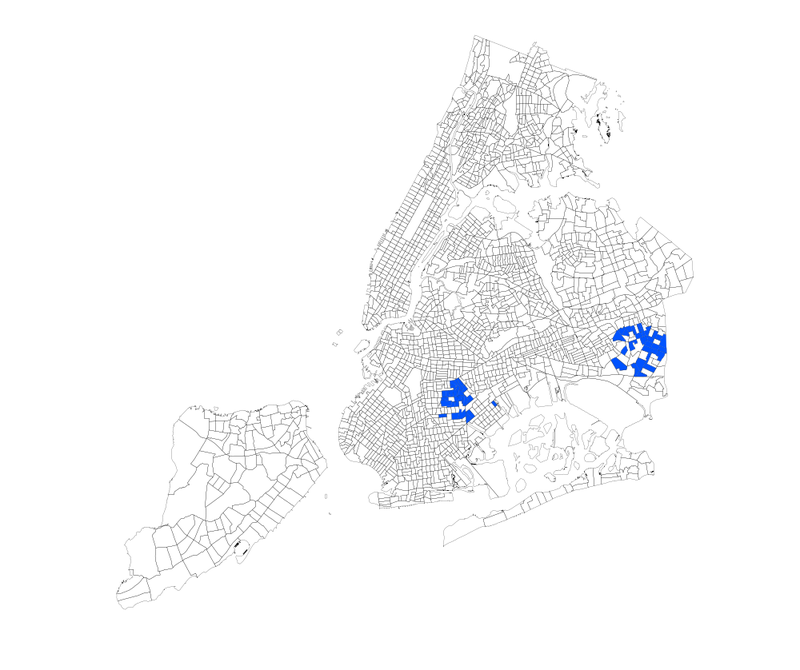 But by far the second most significant separation – white-Latino segregation – is also very extreme in New York. The same Census analysis that found NYC was the second-most-segregated metro area in terms of white and black people found that it was the third-most-segregated metro area in terms of white and Latino people. That’s obviously not the end of the story either, though. If you know about or are curious about some other aspect of segregation, leave a comment. Daniel Hertz is a masters student at the Harris School of Public Policy at the University of Chicago. This post originally appeared in City Notes on April 14, 2014. Entrenched segregation is lefty policy "unintended consequence"
Submitted by PhilBest on Tue, 10/21/2014 - 03:26. It is ironic that it is the libbewwal coastal cities that have the most intractable segregation problems, while it is the once-redneck cities that have the least segregation now. Glaeser and Vigdor: "The End of the Segregated Century"
".....The freedom to choose one’s location has helped reduce segregation. Segregation has declined in part because African-Americans left older, more segregated, cities and moved to less segregated Sun Belt cities and suburbs. This process occurred despite some public attempts to keep people in these older areas...."
"......Gentrification and immigration have made a dent in segregation. While these phenomena are clearly important in some areas, the rise of black suburbanization explains much more of the decline in segregation......."
As Thomas Sowell points out in "Green Disparate Impact", and Randall Pozdena in "The New Segregation", anti-growth policies that drive up the price of all housing, increase segregation as an unintended consequence. Martin Luther King was right when he spoke of "the free market as colour-blind". Nothing has decreased segregation as much as automobile based suburban development and the systemic increase of home ownership. HUD data on home ownership by race also confirm that it is the liberal coastal smart-growth-mad cities with the lowest rates of home ownership among minorities. Why Do We Care About Transportation Mode Share?